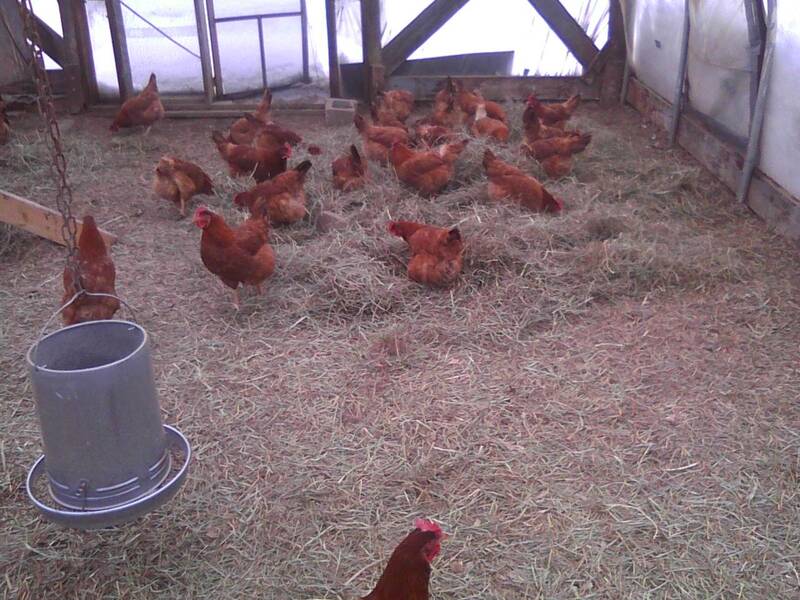 The severe weather is taking its toll on our laying hens. Cold has not been the problem. It’s the confinement. The deep snow has blocked their access to their yard. Even though they have double the recommended space per bird inside the greenhouse, some of them have taken to pecking the others. This is a common problem when chickens are confined. Some theories blame it on parasites, nutritional deficiency, or genetics. We believe the most plausible theory is “misdirected foraging behavior,” and the only ultimate cure will be running around outside when the snow clears. However, we are covering all the bases with a buckshot approach: Diatomaceous earth dustbaths for mites, extra protein, novel stimuli to distract them, and scratch feed in their bedding to keep them busy foraging. The one thing we will not try is the standard industrial chicken farm cure: slicing off their beaks. We are hoping March goes out like a lamb as usual, so we can get them outside soon. We will be working on some adjustments for next year, so we can be better prepared for this much snow.